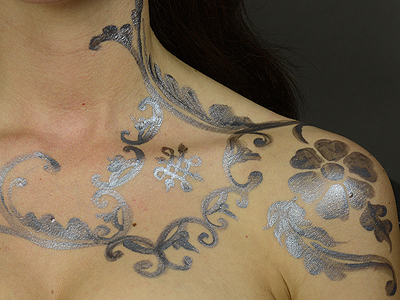 “Silver henna” is not henna: it is a technique similar to henna created with 'white henna' techniques. Lesson #1: How do you apply 'white henna' paste with a cone? Lesson #2: How do you apply Temptu temporary tattoo paint as 'white henna'? 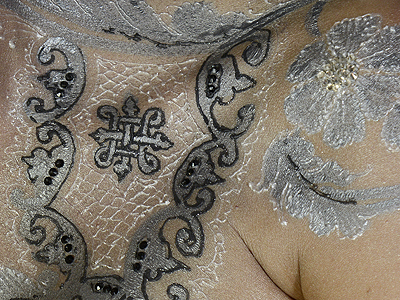 Lesson #3: How do you combine 'white henna' paste with white temporary tattoos? 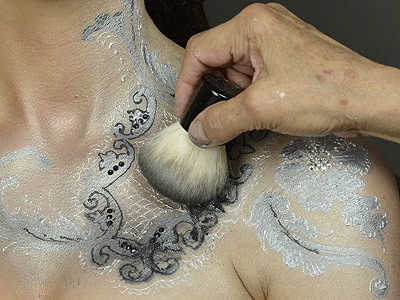 This body art, often referred to as 'white henna' is created with a group of materials specially formulated to work together and safely extend the range of colors and applications available to henna artists and their clients. All of these materials are waterproof, absolutely safe for use on skin, and last from three to ten days depending on care. The pigments and medium of Temptu tend to separate. Vigorously shake the bottle of Temptu each time before you use it. Put a few drops of Temptu temporary tattoo paint on a plate. Allow the Temptu to dry and thicken for a minute or two. Temptu can be thinned with 91% isopropyl alcohol. Brushes can be eleaned with 91% isopropyl alcohol. Apply Temptu with a brush on clean, dry skin. This color of Temptu is 'gunmetal'. Temptu comes in many colors; they can be used as they are or blended to make new colors. Temptu will not stay well on oily or sweaty skin. Cleanse skin of lotion, sunblock, oil and perspiration before beginning work. Temptu temporary tattoo paint dries in a few minutes, but remains slightly sticky. 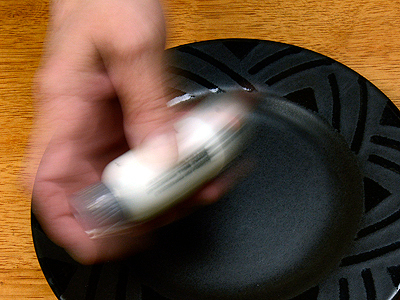 If your brush becomes sticky, clean it with 91% isopropyl alcohol. 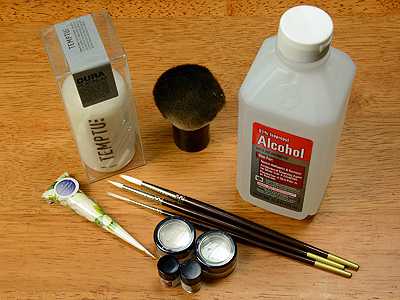 When you have finished your painting work, clean your brushes with isopropyl alcohol. When the painting is finished, brush gilding powder over the silver Temptu to seal the paint and make it durable and waterproof. Generously apply gilding powder to seal the Temptu pattern. When all of the Temptu is sealed, brush away the excess gilding powder. If there is gilding powder still clinging to the skin, rinse the area with water and pat dry. If you want to add flatback gems to your art, apply a drop of Becoming Moonlight® 'white henna' gilding paste, then set a gem on the paste. Pick up the gem with a birthday candle and set it precisely into place. Press a birthday candle onto the dome of a flatback rhinestone. 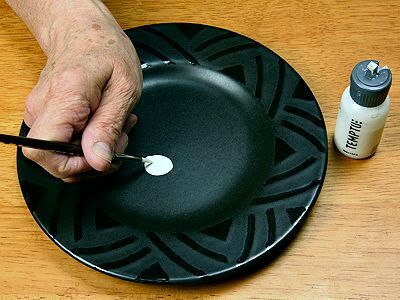 Pick up the gem with the candle and put it into place on the dot of 'white henna' gilding paste. Apply Becoming Moonlight® 'white henna gilding paste to as you would henna, but use much thinner lines. Use the gilding paste to define and enhance your Temptu pattern. If the 'white henna' doesn't flow smoothly from the tip of your cone, wipe it with a bit of paper towel and 91% isopropyl alcohol. Allow the Becoming Moonlight® gilding paste to dry for about ten minutes. Touch the gilding paste gently, to see if it has become firm. Generously apply gilding powder to make the paste durable and waterproof. 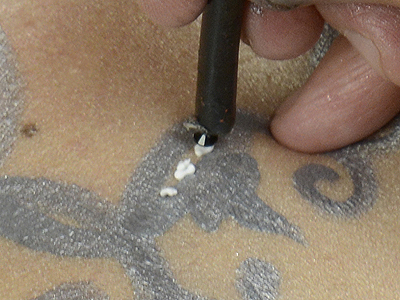 If the brush sticks to the 'white henna' gilding paste, wait a few more minutes for the paste to dry. If your brush gets 'white henna' wtuck in the bristles, clean it with 90% isopropyl alcohol and let it dry. When you have coated all of the Becoming Moonlight® 'white henna' gilding paste with gilding powder, brush away the excess. 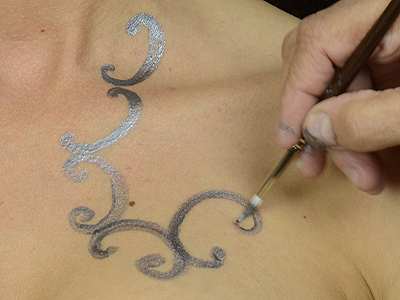 Add more lines of Becoming Moonlight® 'white henna' gilding paste where you would like a second color. 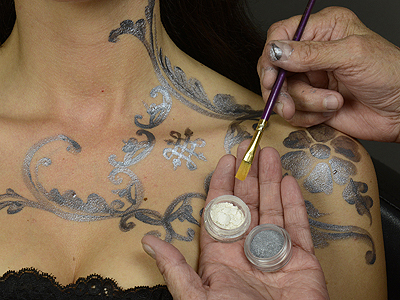 Apply a different color of Becoming Moonlight® gilding powder to the new lines, just as before. Brush away the excess. When your Becoming Moonlight® body art is completed, it will remain on the skin for three to ten days, depending on care.